Come and hear us in London! 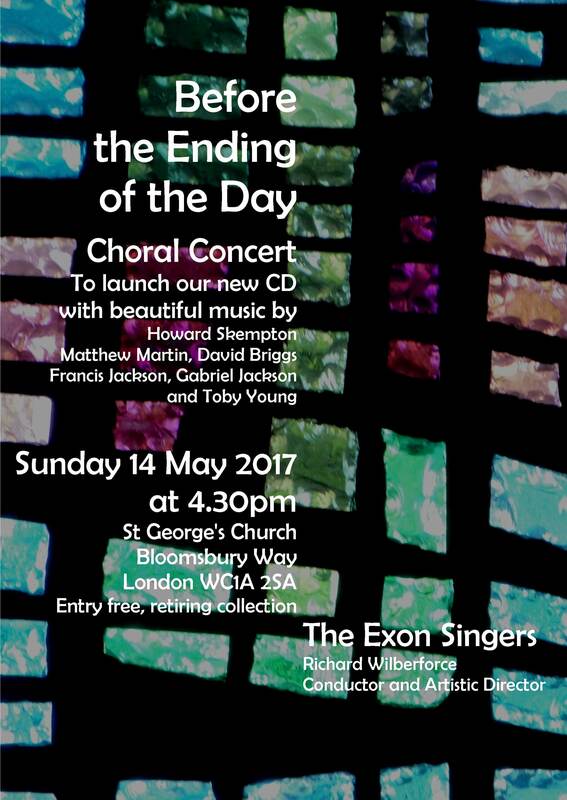 We are giving a concert to launch our new CD, “Before the Ending of the Day”, on Sunday 14th May at 4.30pm at St George’s, Bloomsbury Way, London WC1A 2SA. Entry free, with retiring collection. Download the details here. We will be singing an hour of highlights from our new CD, with music commissioned by the choir from contemporary composers Howard Skempton, Matthew Martin, David Briggs, David Goodenough, Francis Jackson, Gabriel Jackson, Toby Young, Joseph Phibbs, and Gareth Treseder. We hope to see you then. Please note the postcode given in the text regarding this concert is wrong – it says WA1A but should be WC1A as on your flyer…. Looking forward to the concert & CD. Wishing Dr Francis Jackson a Happy 100th Birthday! Our new CD is out!